Goal Achieved! ^-^ I’m not longer taking orders. To the people who ordered, please make sure YOU pay the PayPal fee. 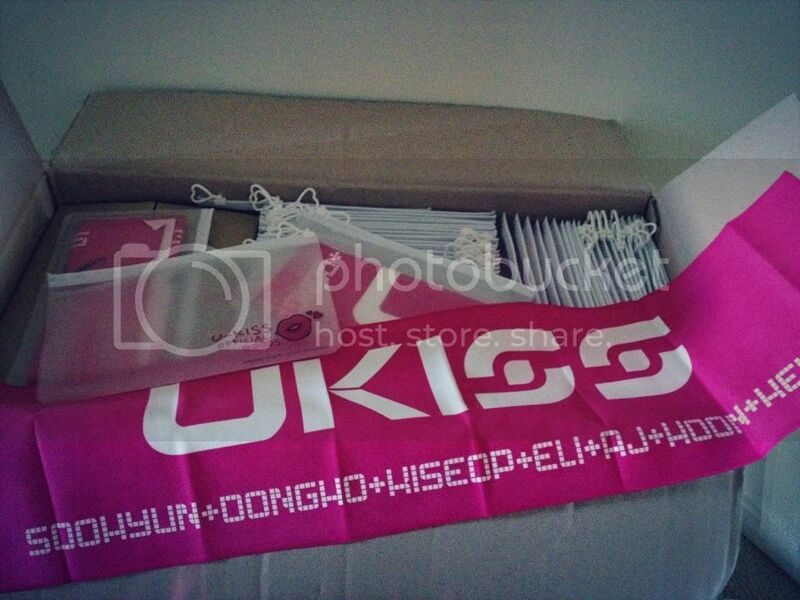 U-KISS’s official fan cafe has finally opened their U-KISS slogan orders to overseas residents. Due to the crazy shipping flat rate, I’m reaching out to Kiss Mes who are financially weak and are interested in having a U-KISS slogan to call their own, like myself! By collectively ordering the official slogans, we can minimise the shipping costs and save some money to buy more U-KISS albums! Please read through the details carefully before placing an order. 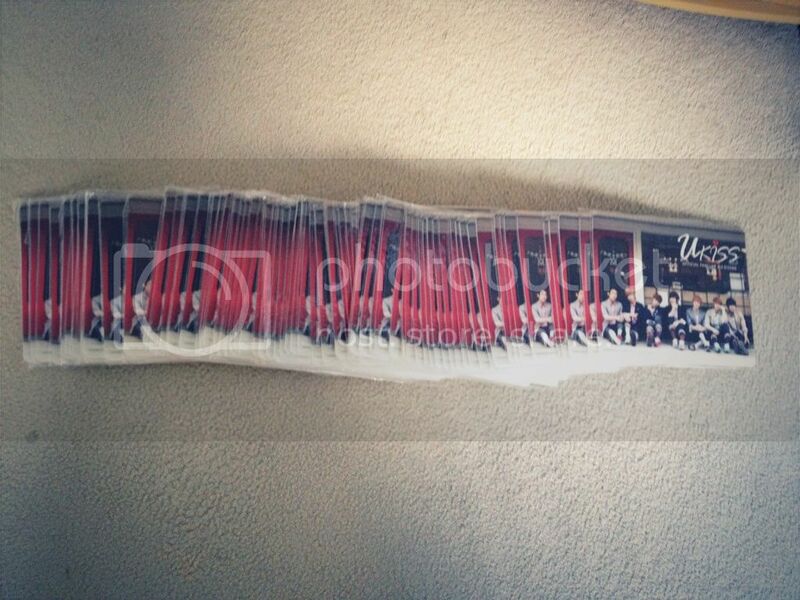 If you order with the cafe, one slogan = $35AUD, two slogans = $45AUD, three slogans = $55AUD, etc. TOTAL: $18AUD for ONE slogan. With every additional slogan, please add $12AUD to your order. If you order with the survey, one slogan = $18AUD, two slogans = $30AUD, three slogans = $42AUD, etc. In order to keep the prices at this rate, we MUST be able to order 50 slogans. If I cannot gather enough orders, please be aware that the prices WILL increase from the ones stated above. Please fill out the form and post in the comments section below if you wish to place an order and I will contact you with payment details. I will not earn any money from this survey, I simply want to help Kiss Mes order slogans at a cheaper price. Think of it as we’re pitching in money to buy a tub of ice cream to share together. I have added $1-2 to the shipping prices to cover hidden postage and payment fees throughout the transactions between NH Media & myself. Please make sure you have the money at hand to transfer to me. There can be NO delays. The cafe deadline for ordering is May 21st. I will be using standard shipping. I will NOT be responsible for lost packages. 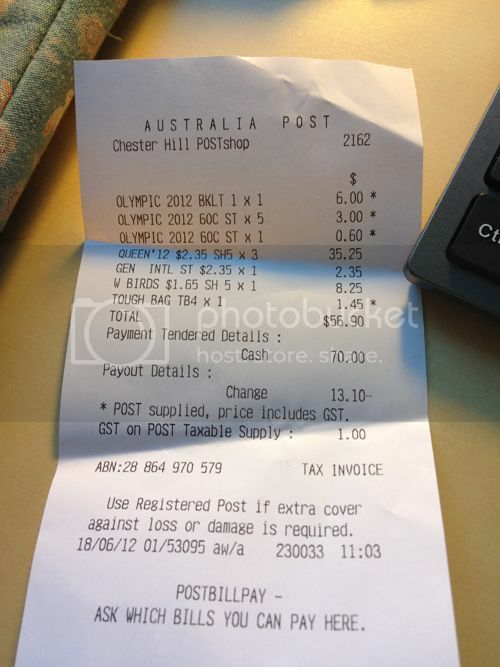 If you wish to track your order through the post, be prepared to pay the extra shipping fees. 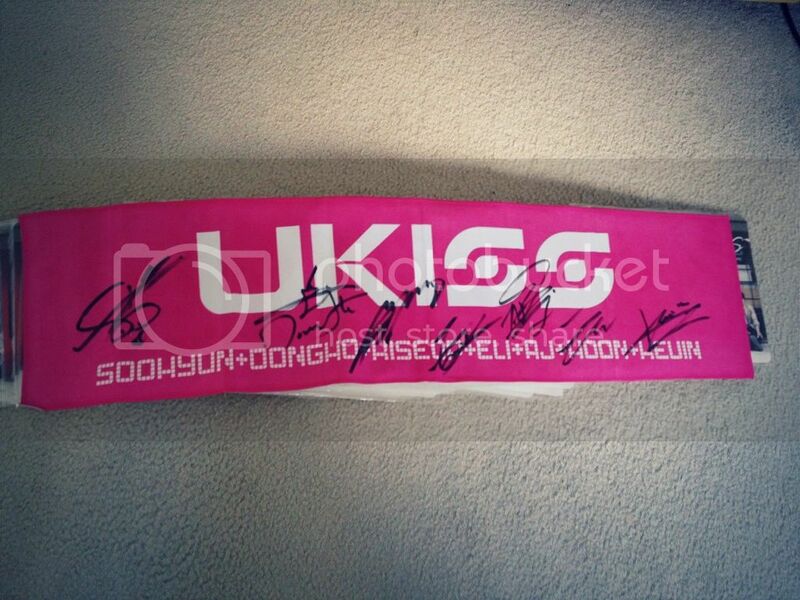 Free U-KISS mouse pad with EACH slogan ordered! If you have any questions, feel free to leave them in the comments, tweet me or email me! We must fill the goal, guys! Sorry,what's the diff with the cafe & survey? ^ You mean between the slogans on the cafe & survey? They are the same, it's the price that's different. If needed I can purchase a few more to fill out the required amount. Is the slogan a towel? Thanks for organizing something great like that! We (Kiss Me Austria) will try to purchase at least 5 towels. We'll contact you soon! @LonesoneMultiAngel: Thank you! I'll keep that in mind. @Anonymous on 5/12/12: No, it is not a towel. Think of a small banner instead. Very roughly putting it, it's about 65cm (w) x 20cm (h). @YASHII: Thank you. :) Looking forward to hearing from you. Which paypal email should the payment be sent to? 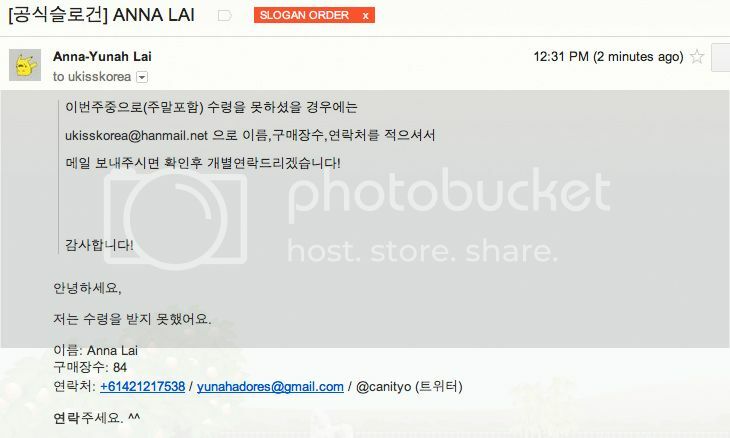 I've sent you an email, Yunah! please check it! Lol we're sooooooo sorry!! but is it possible to add another one?? If not it's okay, just because we thought the deadline would be later, so our members are still joining. @JULIANA & SHERYL: Sorry guys, I closed the survey 2 days ago. I am no longer taking anymore orders, please read the green text on the first post.